Former Pa. Gov. 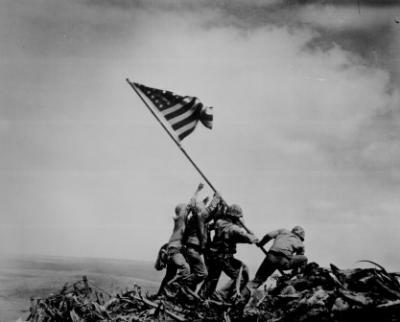 and Erie native Tom Ridge will narrate a documentary about the battle for Iwo Jima and the soldiers featured in the iconic Pulitzer-Prize winning photograph of the U.S. flag being raised on Mt. Suribachi. Ridge told the Johnstown Tribune Democrat, "the story reveals so much about the courage these men and what they went through. I'm sure not many people realize that several of them died within a few days." Ridge, who served in the U.S. Army infantry during the Vietnam War, fit the film's brand, according to its producers, because of his service and personal experience in Vietnam. The film, "Our Flag Still Waves," features Franklin native Michael Strank, who was among the soldiers who raised the American flag at Mt. Suribachi. Strank was killed in action less than a week after the flag was raised and photograph taken on Iwo Jima. The film will debut on February 21 at the Cambria County War Memorial Arena.